I promised a special post about a new Lync tool last week. And here it is! One of the main advantages in Lync Server is the interconnectivity of its communications tools. (It IS called “Unified Communications,” after all.) That's what I'm talking about today – a third-party tool that builds on Lync's interconnectivity. The other day a Mr. Fred Natzke, an Australian software developer, emailed me. He's built a tool called psIMAlerts for use on Lync, and he wanted to let me know. I took a look at this tool – and decided it was a great thing to blog about here! psIMAlerts is a Powershell “cmdlet” that lets an administrator send bulk messages out over Lync's IM. (It also works on OCS 2007 R2.) If you're not familiar with “cmdlets,” think of them as Powershell mini-apps. They're script-based tools that execute specific functions using .NET. Makes for a lot of flexibility – as this developer has demonstrated. At first, the idea of sending out a bulk IM alert resurrected the “spim” notion of IM-based spam from years ago. But I looked through the information sent to me, and the developer's site (Blue Quality Studios) and was reassured. In fact, the usefulness grew on me pretty fast. It goes right back to the Unified Communications intent: communicate with people when it's needed, using the best available channel. Sending a bulk email out doesn't work if you're warning everyone that the email server's down. But an IM would! 1,) An IT Admin sending alert to notify staff that an Exchange server isn't working properly. Anyone affected by this can simply IM him back for updates, instead of waiting on the help desk phones. 2) Auto-notification of log volume limits reached. 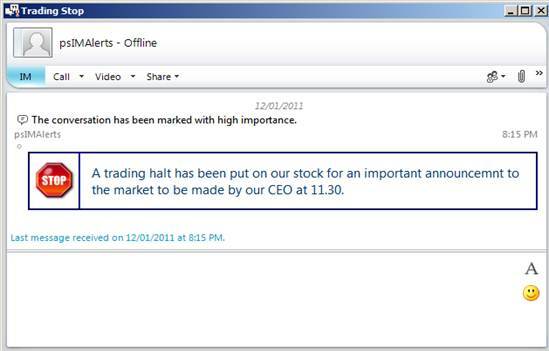 3) Important financial announcements that the finance (or Marketing) department needs to see. 4) Announcing a “Service Interruption” while IT fixes a broken T1 line. The psIMAlerts tool allows customization not only of the message, but of its template. Mr. Natzke has written 12 HTML-based message templates (included with the tool). I'm posting a couple examples to illustrate. It's important to note that all links in these IM alerts are active. So you can push out a URL to co-workers at the same time. Because it's a Powershell cmdlet, there's no new desktop software. 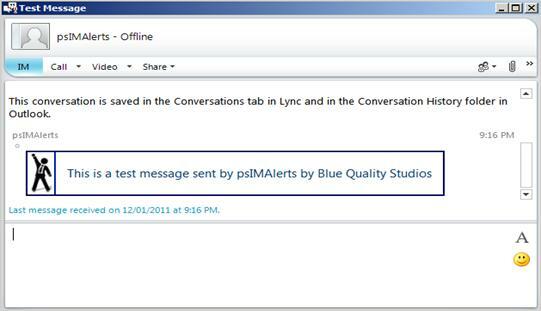 If you're running Office Communicator (for OCS) or Lync 2010 (for Lync Server) you're ready to use psIMAlerts. You can download psIMAlerts for a free 14-day trial here. The tool costs 150 Australian (about $150 in USD) for full use. Order it here. Yes, I've tried the tool out. It works flawlessly. Well worth it if you want to send out any kind of bulk notifications. Thanks for the email Fred! Best of luck with your work. Are you working on Lync-based software tools? Email me or leave a comment. I'd like to hear about it.